Zeb McCurry’s Grave Plot B, Row 14, Grave 6, Saint Mihiel American Cemetery and Memorial at Thiaucourt-Regniéville, France. Zeb’s WWI service record card gives his name as Zeb McCurry with an address of Relief in Yancey County and age of 22 6/12. He reported to the Mitchell County Draft Board on September 19, 1917 and was listed as Zeb McCourry. His military service record card with the last name McCurry indicates the person to be notified of death is a sister, Nettie Nelson of Erving, Massachusetts. The passenger list of his troop transport ship going out lists him as Zeb McCurry with a sister Nettie Nelson in Irvin, TN. Census records in 1910 show a Nettie McCoury, age 15, living in Bradshaw, Mitchell County, North Carolina. A marriage record from Unicoi County in 1914 shows that Nettie McCurry married Clyde Nelson on August 22ndwhich suggests that their home was in Erwin, TN. The 1910 Federal Census shows Nettie (15), James (18), and Luther (23) McCoury as servants in the household of Isaac and Alice Lewis in the Bradshaw Township of Mitchell County. According to the census record James would be 25 in 1917. With so many discrepancies it is very possible that James may have been known also as Zeb. The only other Zeb McCurry known locally was Zeb (Zebedee) McCourry, born in 1870, died in 1951, and buried in the Tipton Hill Community Cemetery along with Mary (1866), Julia (1869), and Luther L. (1903). Zeb and Hannah Miller were married November 24, 1916 by R.N. Willis at the Church of the Brethren in Pigeon Roost, Bradshaw Township. The marriage certificate record says McCoury; however, the marriage license on file with the Mitchell County Register of Deeds says McCourry and gives his father as W.B. McCourry. He was 22 and she was 18. Hannah was the sister of the locally famous writer Harvey J. Miller, the Sage of Pigeon Roost. Zeb and Hannah realized they were to be parents early in 1917. He was ordered to report for military service on September 8th in Bakersville and sent to Camp Jackson on September 9th. 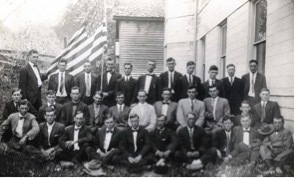 The photograph above is confirmed to have been taken of this specific group of men behind the Mitchell County Courthouse. It is most likely that he is among those other yet to be identified men in that photograph. He was accepted for service on October 7, 1917 at Camp Jackson. Ten days later Hannah gave birth to their son Earnest whose death certificate clearly indicates his last name as McCourry. Earnest died at 16 months and was buried with the Barnetts in the Barnett Cemetery above Grover Byrd’s on Pigeon Roost. We have no record of Zeb being able to visit with his wife or son before he was sent overseas on April 24, 1918 on the ship, Leviathan. Zeb was first in Company C of the 322ndInfantry then in Company A of the 11thInfantry Regiment. By May 1918 his regiment joined the 5th Division near Chaumont, France. Zeb fought in the ongoing battles in the very rugged terrain of the Vosges Mountains. He survived many other encounters including the Battle of St. Mihiel, September 12-15 which faltered as artillery and food supplies were left behind on the muddy roads. His regiment continued to the Meuse-Argonne offensives which lasted from September 26thuntil Armistice on November 11th. During the three hours preceding H hour, the Allies expended more ammunition than both sides managed to fire throughout the four years of the American Civil War. The cost was later calculated to have been $1 million per minute. Unfortunately, Zeb was not able to see this, for he was killed on September 29thand is buried in Plot B, Row 14, Grave 6, Saint Mihiel American Cemetery and Memorial at Thiaucourt-Regniéville, France. His marker says Zeb McCourry. Hannah later married Rev. Jeano Barnett, son of Chrisenberry & Hulda Edwards Barnett and is buried near Earnest.